I was looking for a way to better engage with my campus community and applying to our activities programming board seemed like a great opportunity to do that. Senior Music Director was a position that caught my eye because of my love for music and the effect it has had on my life thus far. 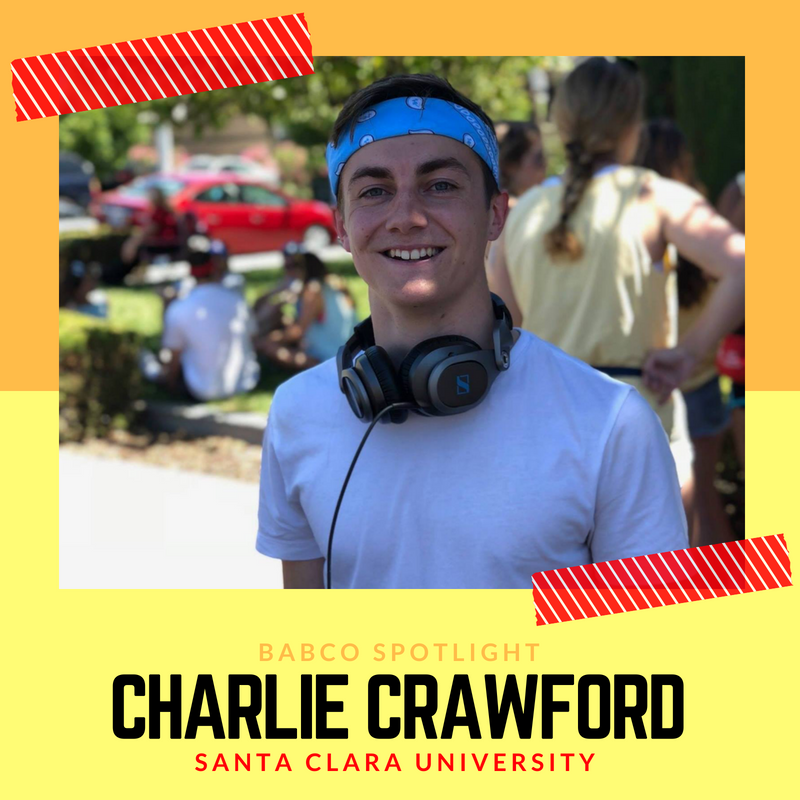 I am the president of SCU A Cappella and leader of the SCU Testostertones, which is one of the five groups on campus. In addition to a cappella I sing with the university’s chamber singers and concert choir. Finally I DJ formals, and parties both on and off campus on a weekly basis. I wanted to incorporate these personal interests into my music director role so as to attract a diverse group of students to wide variety of music themed events. For my music director role I was bestowed with a different type responsibility than I was used to in years past. Looking back at the year I’m really glad I challenged myself to stay disciplined and handle all of the new challenges thrown my way. There were times when I got frustrated and even embarrassed over timing constraints or silly mistakes I had made, but they all helped me progress as a student programmer and team leader. My biggest event of the year, which took up most of my time and effort was Santa Clara University’s spring concert featuring BØRNS. My goal was to find an artist that I thought would appeal to the students on campus and deliver a memorable performance. Even getting the opportunity to plan a show like that was a privilege and one of the reasons the programming board stood out to me. I wanted more than anything to be part of a group that would work hard to bring the campus together and allow me to create something the entire student body could enjoy. I can’t wait to start working on our next big music show. Last year was my first taste of what working on a programming board is like and now I’m ready to pick up right where I left off. I have a newfound sense of confidence and excitement about returning for a second year. There is less fear about uncertainty and new ways I would like to improve and work with some of the wonderful people I built relationships with last year. Be willing to make mistakes and learn from those mistakes on the job. Preparation is obviously extremely important and necessary for success but at the same time flexibility is crucial. Even through stressful times, don’t let emotions get the best of you. If you are running an event, people will rely on you to be calm, collected, and focused. Be professional and keep your composure at all times because it ultimately will reflect your maturity and leadership style. You can lead effectively and sternly without being a tyrant. Sometimes situations call for you to be assertive, other times listening and following is equally if not more important. Find a balance of these traits and treat people with the same respect you would like to be given. Managing people is personally the most important part of my job and must be valued. You never know when you might be working with someone again, so you might as well be friendly, courteous, and sincere. At the very least make the most of the people you engage with, and the events you do. Build relationships that can help you in the future and take nothing for granted. Which musical performer or comedian do you expect to be popular on college campuses this Fall? Why? While many artists have gained traction in late 2017 and early 2018, the one artist that stands out to me is AJR. AJR is an indie/electronic pop group made up of 3 brothers who are young, creative, and primed for success. I believe it is very hard for young artists to find and ultimately embrace a certain sound. Good artists can develop their sound but retain a distinguishable style through future evolutions of their music. AJR has effectively done just that with their musical identity. Their music resembles the form of other popular artists while providing a lively, youthful, and unique spirit. I like to think of them as if 21 Pilots and Jon Bellion were fused together to form a new group. Quite simply the group has a distinctive sound and creative style that will only continue to blossom in the music scene. Their blend of electronic and indie pop should resonate with a variety college students. AJR’s 2017 album The Click is a great example of the direction the group is taking. The album features a brilliant mixture of upbeat anthems and earnest ballads, which comes together to construct a high quality album. While the instrumentals are catchy and tuneful, The Click’s lyrics might be the album’s greatest strength. AJR does a fantastic job of incorporating playful yet candid verses in almost every one of their songs. Needless to say I’m eagerly awaiting the arrival of their next album. It is also very encouraging to see AJR active in 2018 with the release of new singles, collaborations with other prominent artists, and even electronic remixes.